Keep an eye on labels – your secret for healthier choices! Home » Keep an eye on labels – your secret for healthier choices! Almost 6 out of 10 Portuguese (5.9 million people) are obese or already exhibit pre-obesity characteristics, and the prevalence of nutrition related diseases is very high among the Portuguese population. Hypertension and other cardiovascular diseases, diabetes as well as some cancers have been linked to excess sugars, saturated fats and salt. Bad food choices can have an impact on health. Some pathologies can be prevented with a more informed population. Understanding what is written on the label of your yogurt or your favorite cookies, can it help you make a better and more rational food choice? Experts believe so. In Western societies, the incidence of food-related illnesses is increasing. High-salt, high-sugar, high-fat, high-calorie food and sedentary lifestyle are focused as main causes of the increase of obesity and disabling or chronic diseases. (DGS, 2017; WHO, 2016). In Portugal the figures are not very bright either. In 2008, according a governmental survey, 30% of the students were overweight and among these, nearly 10% were obese. According to the latest National Food Survey (2017) ,more than a half of the population (52.8%), aged 18 or over, are overweight or obese. Other disturbing conclusions from recent governmental surveys have confirmed the dark statistics. The authorities stressed that, as scientific studies have shown, the prevalence of nutrition related diseases is very high among the Portuguese population, where about 1 in 4 Portuguese has hypertension and 1 in 10 suffers from diabetes (DGS, 2017; Matos, 2018). On the other hand, the conclusions from the Integrated Strategy for the Promotion of Health Eating (EIPAS, 2017) point out some direct causes: “In Portugal, inadequate eating habits are the risk factor that most contributes to the total years of lost healthy life in the Portuguese population and chronic diseases (. . . ) . Scientific evidence shows that high sugar consumption is related to the prevalence of chronic diseases such as obesity and diabetes, the excessive consumption of salt associated with hypertension and cerebrovascular disease” . Can some pathologies be prevented with changes in lifestyle and diet? Experts believe so! (DGS, 2017;EIPAS, 2017; WHO, 2017). But are the Portuguese informed and able to understand the nutritional value of what they are eating? Recent governmental laws demand that food labels must include the nutritional value of what we are eating, namely the amount of sugar, fat and salt. But… Is the average Portuguese used to read and interpret the food labels? Do Teenagers really care about the food labels when buying their favourite cereals, soda or pizza? Surveys on this topic were held at a Portuguese secondary school – Caneças high school. 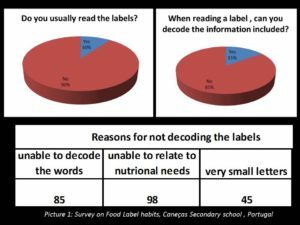 100 students answered a brief questionnaire and the results could not be more disturbing: 90% do not usually care about reading the nutritional characteristics included in the food labels; 85% state having problems on decoding the information included, namely due to lack of knowledge as they assume not understanding either the words/concepts themselves or how to relate what is written to their body needs. (picture 1). Based on these survey results the Eco-School council decided a campaign should be held aiming to make the students and the community more aware of the importance of the labels nutritional value as well of the importance of reducing salt, sugar and fat levels. Looking at the label of a product and interpreting it can be the passport to a healthier life (DECO, 2017). 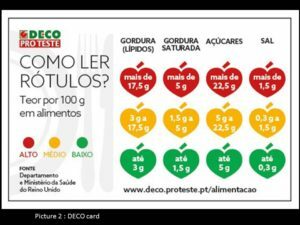 Defending these beliefs, DECO created a small card which makes us easily decode the nutritional components included in the label . “It can be printed from an internet link”, Joao Corça informed us, ” and easily carried in any wallet . Easy to be handled at any store. Every buyer can identify whether that element has average or excess sugar, fat or salt. It uses the colours of the traffic lights. This idea is not completely new in the world, We based this card on the British Health department experience”. According to the latest recommendations of the World Health Organization, the consumption of salt by An average adult should not exceed 5 grams per day about 1 tsp (Pay attention to words like monosodium glutamate and sodium bicarbonate, which increase the sodium (salt) content of foods). Most Portuguese – 89.9% of men and 65.5% of women – consume too much salt , 7.3grams per day, instead of consume salt above the recommended maximum level of 5 grams. Keep an eye on the sugars! The Portuguese consume on average 90 grams of sugar per day, when the recommended daily average is only 50 grams. In addition to cakes and cookies, soft drinks are one of the main sources of this sugar, with their consumption being more frequent in young people – 40% of Portuguese adolescents consume more than one soda per day. Keep an eye on labels – the secret for healthier choices but… do not keep it too secret , convey this message at home and in your community – this is Caneças high school motto for 2018 Healthy Food Campaign. Knowing how to read a label and paying attention to the nutritional value of food is fundamental for a healthy diet, since it can favor choices for a more balanced consumption.